Craftsbury Municipal Forest Committee, guardian of our future. next to the stump of the old growth maple and the new maple was carefully, and painstakingly, put in place. equipment, time and muscle that made this project possible. Thanks also to the members of the forest committee – Jim Moffatt, Stuart LaPoint, Rob Libby, Chris Sanville, Robert Linck, Ann Ingerson and Barbara Alexander – for their help in planting a tree that will add to the beauty of the Common and be a witness to Craftsbury’s history for decades to come. Most of the cost for the project was covered by funds from the Municipal Forest Committee Account. The Village Improvement Society as well as Jim Moffatt and Stuart LaPoint donated funds to help cover the expenses. We would like to thank the Orleans County Forester, Jared Nunery, for his time surveying the ecological and timber resources on the Coburn Hill Lot in preparation for the development of a new management plan. Jim Moffatt (chair), Rob Libby (vice chair), Barbara Alexander (secretary), Ann Ingerson, Stuart LaPoint, Jim Jones, Logan Jones, Chris Sanville, Ben Alexander and Robert Linck. Orleans County Forester Jared Nunnery worked with Craftsbury’s Municipal Forest Committee to develop a detailed management plan for the town forest parcel known as the Coburn Hill lot, completed in the spring of 2019. The work draws from an earlier ecological inventory by forester and town resident Ross Morgan, and provides background on the history of the property as well as plans for the future. The map shows the location of a short unmaintained trail to an overlook that the Municipal Forest Committee constructed several years ago. Stuart LaPoint has been looking into expanding our Big Tree Project by putting the wonderful photos taken by Elinor Osborn and June Cook on a disc and including them on the town web site. Anyone wishing to view the photographs before this project is completed or to suggest a new tree for our photo library should contact Stuart. 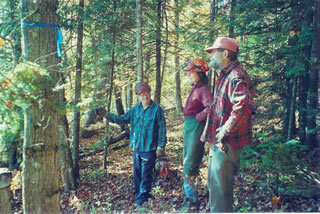 We know there are many outstanding trees in Craftsbury just waiting to be recognized.